US President Donald Trump’s top economic adviser, Larry Kudlow, has suffered what doctors say was a “very mild” heart attack. He is expected to make a full recovery, White House press secretary Sarah Huckabee Sanders said in a statement. President Trump first tweeted the news before his historic meeting with North Korean leader Kim Jong-un in Singapore. Mr Kudlow recently accompanied the president to a G7 summit in Canada that ended in disarray. “Larry is currently in good condition at Walter Reed National Military Medical Center and his doctors expect he will make a full and speedy recovery,” Ms Sanders said. Mr Kudlow joined the Trump administration earlier this year and has taken a tough stance on trade. The US imposed tariffs on steel and aluminium imports from the EU, Canada and Mexico on 1 June, setting the scene for a tense G7 meeting hosted by Canadian Prime Minister Justin Trudeau over the weekend. The summit ended with Mr Trudeau vowing to press ahead with retaliatory tariffs and Mr Trump retracting his endorsement of the joint statement and lashing out at his host. 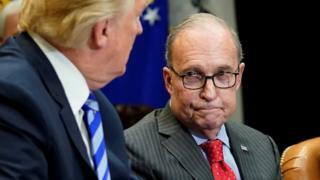 Mr Kudlow has defended the new tariffs and said his boss should not be blamed for trade tensions.